The concept of matched betting is pretty simple. You back and lay a selection to cover all outcomes and should return a profit whatever the result is. Things get a little trickier when it comes to accumulators as they consist of multiple bets all bundled together into one and so a bit of thought has to go into how to lay them in order to return an overall profit. There are a few different methods to choose from when it comes to laying accumulators which we will go through in the article. Some of the methods have little to no risk and should return relatively small profits whereas some have a higher risk but can return much larger profits. Pre-made ACCA’s are by far the easiest route to go down when it comes to placing and laying accumulators. They are ACCA’s which have been put together by bookmakers and customers can simply click to add to their bet slip, enter their back stake and place the bet. One advantage of pre-made accumulators is that you can sometimes find lay markets for them on betting exchanges such as Betfair Exchange, Smarkets or Matchbook. This means that you can lay the entire ACCA just as you would a single bet and there is no need to lay legs individually. You’ll often find lay markets for popular ACCA offers such as Skybet’s Soccer Special Price Boost or William Hill’s Super Odds Price Boost. These are pre-made accumulators that Skybet and William Hill have boosted the odds for and are usually available on weekends when Premier League & Championship games are taking place. As these are extremely popular with punters, you should be able to find lay markets for them on the betting exchanges. If you need to place an accumulator, either as a qualifying bet or with a free bet, this may be the best option if they’re available as they are quick and hassle-free to lay. As you can see from the first image above, Skybet are offering two pre-made ACCA’s. One for Portugal, Scotland & Sweden all to win and one for Portugal, Scotland & Russia all to win. The second image shows the pre-made lay market on Betfair Exchange. The first ACCA shows a nice arbing opportunity from which you could make a profit simply by backing and laying the ACCA and the second ACCA shows a perfect match with the back and lay odds of 15.0 each. This ACCA will not return a profit by backing and laying it but it would be useful if you had a free bet to use as you can use the pre-made lay market to lay the ACCA all in one go. Your back bet could be with any bookmaker and to work out your lay stakes you would simply use the combined back odds of the ACCA from the bookmaker and the lay odds for the pre-made ACCA on Betfair in a matched betting calculator. If you are unable to find a pre-made ACCA then you may have to lay each leg manually. This method requires a little more work but is still pretty simple thanks to ProfitSquad’s ACCA Spreadsheet. Similar to laying a standard bet, you want to make sure all legs of your accumulator have close back and lay odds. As you are adding multiple bets into one, the qualifying losses for each leg can add up to sizable amounts and if the odds are too far apart, it may mean that the ACCA is unprofitable. You need to ensure that each leg in your accumulator don’t overlap as you need to know the result of the previous leg in order to whether or not to lay the next one. Therefore, it is advised that you leave a minimum of 15 minutes between each leg. For example, if the first leg in your accumulator is a football match which kicks off at 3pm and is due to finish at 4:45pm, make sure the next leg of your ACCA does not start until 5pm or later so that you have that gap to check what the result is and place the lay bet on the second leg if needed. The above image shows the ProfitSquad ACCA Spreadsheet. By entering the bet details such as stake, back/lay odds and exchange commission, just as you would on a matched betting calculator, it calculates the ideal lay stake for each leg of your accumulator. In the example above, we have placed a £10 bet on an accumulator with three legs and the advised lay stake has been calculated and displayed under the ‘Advised’ column. The min and max profit is also calculated and displayed in the box on the right. In this example, we will make a loss of £0.51 whether our ACCA wins or loses. This would be an acceptable loss for a qualifying bet should we be receiving a free bet for placing this accumulator. We would start by placing a £9.68 lay stake on the first leg which is Dortmund to win. This is the only lay bet we should place at this point and we should wait to see what the final result is before potentially placing the next lay bet. If Dortmund lose the match, we are finished with the ACCA as it has lost. We will receive some winnings back in our exchange account as we layed this bet and will be £0.51 down overall as shown in the box on the right of the image. However, we will have qualified for a free bet from which we should be able to make an overall profit. If Dortmund win the match, we need to mark the bet as won in the ‘Result’ column and then place the advised lay stake on the next bet which is for Bayern Munich to win. We continue laying bets after each leg has finished providing the previous leg wins. If at any point a leg loses, you stop laying the legs and you are done with your bets. Some bookmakers may credit you with a free bet but state that it must be used on accumulators. You can use the ACCA Spreadsheet to calculate the lay stakes for each leg just as you would with a qualifying bet. The only thing you need to do is select ‘Free Bet SNR’ from the ‘Method’ drop-down menu. The above image shows the ACCA Spreadsheet set up in ‘Free Bet Mode’. You can see that using a £10 free bet as the stake, we will return a profit of £5.84 whether our ACCA wins or loses. Another option should you be unable to find a pre-made ACCA is to use ProfitSquad’s AccaBacker tool. 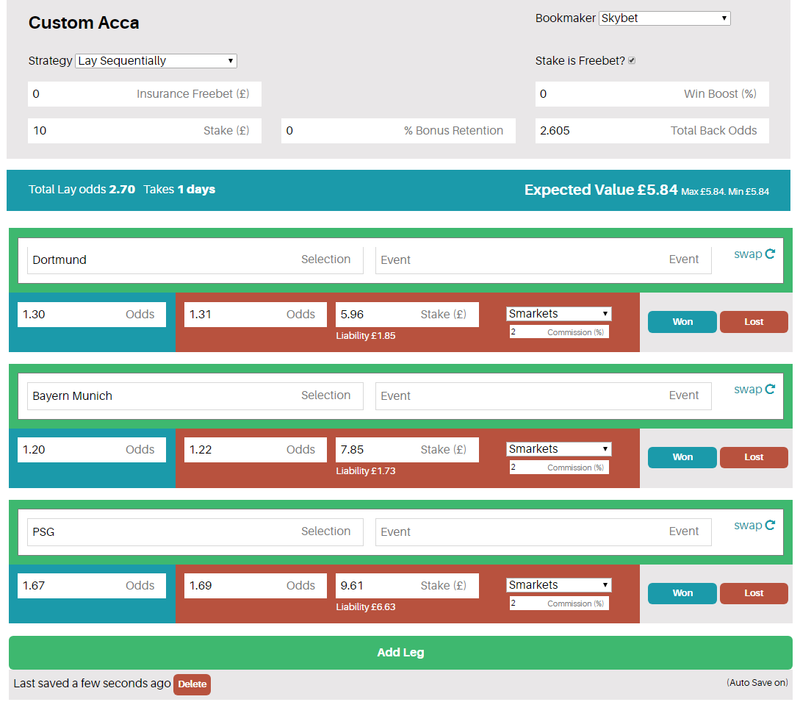 AccaBackers is an ACCA tool which helps you lay accumulators by calculating the ideal lay stakes for each leg. You can either use AccaBackers for standard accumulators or for ACCA Insurance offers. AccaBackers works in a similar way to the ACCA spreadsheet except it is integrated with ProfitSquad’s other matched betting tools such as the OddsMatcher and Bet Tracking feature. This means that not only can you instantly determine the ideal lay stakes for your ACCA’s but you can also find the best matches for the legs of your ACCA. This saves you time manually searching for close matches and will allow you to compile accumulators with greater value, thus returning higher profits from your free bets and lower losses from your qualifying bets. If you are not using AccaBackers for an ACCA Insurance offer, you can choose to create a custom ACCA. Just like with the ACCA spreadsheet, you enter the bet details of each leg and it will automatically calculate the ideal lay stakes. As with the ACCA spreadsheet, using AccaBackers you can choose whether you are using a free bet as your stake or cash. We have selected the free bet option in the screenshot above and AccaBackers displays the same lay stakes and the same return of £5.84 profit as the spreadsheet did. One advantage of using the AccaBacker tool is that you are able to track your bets with the click of a button. Spreadsheets can sometimes get messy and you may not be able to access them on all devices. As the legs in your accumulator are likely to span over several hours, you may be away from your PC when you need to calculate the lay stakes of the next leg. By using the AccaBacker tool, you are able to access your saved accumulators anywhere on any device from within your ProfitSquad account. Simply log in, click on ‘Saved ACCA’s’ and you’ll be able to mark legs as won or lost and view the ideal lay stake for the next leg. Once your ACCA has finished, you can mark it as done and the profit or loss you make will be added to your total matched betting profits in your account so that you can keep track of your progress. As mentioned earlier, there are a few different strategies you can use when laying accumulators. We’ve mentioned some of the tools you can use but have only used one example of a strategy. In the examples above we have used the ‘Lay Sequentially’ method. This is when you lay the first leg of your accumulator, wait until it’s finished and lay the next one if the first leg won. However, there are other strategies which can be used for when you will receive a free bet if your ACCA loses such as in ACCA Insurance offers. These strategies can be used on both the ACCA Spreadsheet and the AccaBacker tool by selecting a strategy from the drop-down menus. With the ‘No Lay’ method, there is no need to lay any of the legs of your accumulator. This may seem like you’re punting the bet but as you will receive a free bet should one leg of your ACCA fail to win, the strategy is +EV providing the back & lay odds of each leg are favourable. When using the No Lay method, you should select legs which are low odds as this gives your accumulator a better chance of winning. If your ACCA has cumulative odds of say, 3/1 (4.0) you can expect it to win roughly 20% of the time. With these odds, you can also expect to receive a free bet around 40% of the time which leaves another 40% of the time when more than one leg of your ACCA will fail to win and you lose your stake and don’t receive a free bet. Overall, you should be up using this method providing your ACCA is +EV. You can check the EV of your ACCA by entering the bet details into the AccaBacker tool or the spreadsheet. 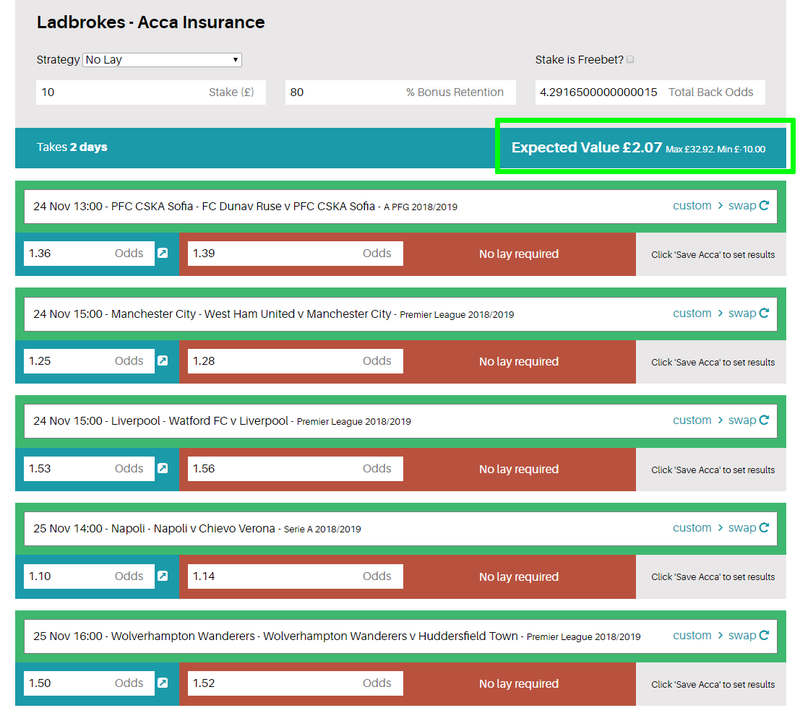 For example, the image above shows a pre-populated accumulator for the Ladbrokes ACCA Insurance offer. Using a £10 stake, AccaBackers shows us that this ACCA has an EV of +£2.07. This means that if we were to place this ACCA an infinite number of times with the ACCA Insurance offer, we would make on average £2.07 profit each time. It’s important to remember that you will not make a profit every time with the No Lay method and it is possible that you could place several bets without either winning your bet or triggering the free bet if one leg loses. If choosing this method, it is advised that you start with small stakes in order to gain confidence in the strategy in the long run. You can use the AccaBacker tool to automatically find the best matches based on back odds and lay odds which will save you time and effort as well as increasing the EV of your bets. The ‘Lay At Start’ method is when you lay ALL of the legs of your accumulator prior to any of them starting. The advantages of this method are that you are able to place all of your lay bets in one go and not have to worry about being available between legs to lay the next leg and also, it means that you are able to select legs which overlap. When using the Lay Sequential method as we did in the examples earlier in this article, each leg must finish before the next one begins to allow you time to place the lay bet based on the result of the previous leg. However, with the Lay At Start method, it doesn’t matter if the legs overlap as all lay bets are placed prior to any of the legs starting. This method looks more natural to the bookmakers as it is common for a punter to, for example, place an ACCA on the Saturday 3pm kick offs. The profit you will make from this strategy varies and you will usually return a profit from winning accumulators and ones which have two or more losses. If one of your legs loses and you receive a free bet, you can expect to make an overall loss of around half of your stake. This is the method we have used in the examples above and involves placing one lay bet at a time and waiting for a leg of your accumulator to finish to place the lay bet on the next leg. With this method, you can expect to make more profit the longer your accumulator is winning. For example, you should make a small profit if the first leg wins, more if the second leg wins etc. You continue to lay each leg of your ACCA in sequence until either your ACCA has won or one leg has lost. If either of these happen, you stop laying the legs and you are finished with the bet. The Lock-In method is similar to the Lay Sequentially method in that all legs must not overlap and that you place your lay bets after the previous leg has finished. The difference with the Lock-In method is that after the first leg has finished, you recalculate the lay stake for the next leg depending on the result. By doing so, you are able to lock in a profit whatever the result of your ACCA. This may sound like the best method given that you are able to return a profit whether your ACCA wins or loses but the returns generally tend to be much lower. Laying accumulators may seem like a daunting task but with the help of either the ACCA Spreadsheet or ProfitSquad’s AccaBacker tool, you should find the process not so dissimilar to laying standard bets. There are a few different strategies to choose from which we have explained above and most people generally tend to stick to one once they get used to them. Some strategies such as the No Lay method carry more risk but can return high profits whereas the Lock-In method carries little risk but returns much lower profits. When trying these methods out for the first time, it is advised that you start with small stakes until you are comfortable with them, after which you can move onto larger stakes and complete more offers. Whether you’re completing ACCA Insurance offers or looking to use a free bet on an accumulator, hopefully, this article has provided some guidance. If you’d like to have access to both the ACCA Spreadsheet and AccaBackers tool, you can join ProfitSquad for just £1. £1 gives you access to a range of user-friendly matched betting tools, hundreds of profitable bookmaker and casino offers, additional strategies such as Each Way Dutching, support 7 days a week and much more. Click here to join ProfitSquad and get started today.